If you want to see all my Christmas posts, check them out HERE and scroll through all of them. 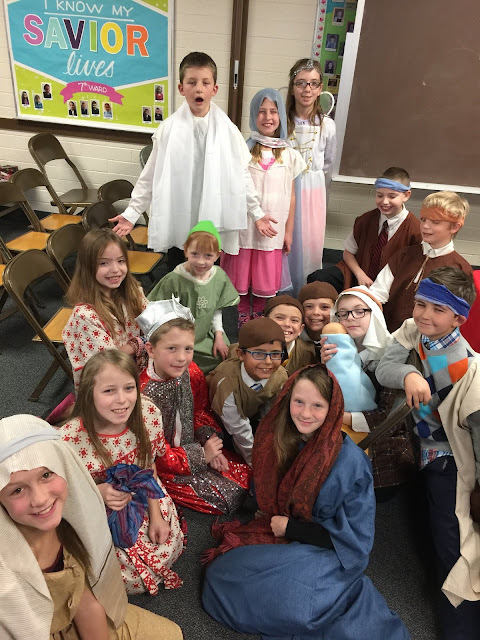 You'll be presenting the Nativity as it is found in Luke along with the birth of Christ in America in Helaman. In between scenes, you'll be singing 5-6 Christmas songs found in the Children's Songbook. Also bring a doll for the baby Jesus - unless one of the small nursery children are willing ;). I've uploaded a full narration HERE that includes all the scriptures to be read. Have children reenact what you are reading in the scriptures (silent acting while someone narrates the scriptures). Have Samuel up on a wall with other primary children below shooting "arrows" at him, not listening, etc. The nativity again with the baby Jesus, Mary, Joseph, Shepherds, Wise Men, angels and all cast members. I've created a little "cheat sheet" HERE so you know what comes when. In between scenes, sing each primary song - congregation and primary actors. *If you do this for the ward Christmas party, make sure to pass out copies of the words. I've typed them up HERE for the congregation to help sing. Then post the words like I do HERE for the primary kids as well!